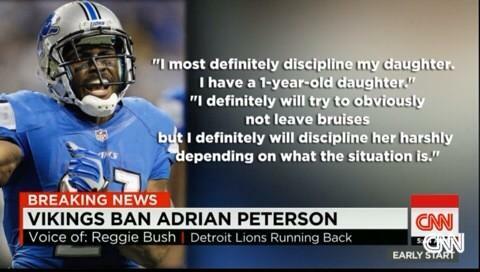 Reggie Bush says he disciplines his daughter “harshly.” She’s ONE. Seriously. What’s going on, here? WTH is she doing, at ONE, to warrant “harsh” discipline? What could the situation POSSIBLY be to “try” to not leave bruises on a one year old? Adrian Peterson’s controversial parenting methods sit just fine with fellow NFL running back Reggie Bush, who said he’d consider “harshly” disciplining his own 1-year-old daughter if the situation arose. Bush spoke out in defense of the embattled Vikings star Tuesday on WFAN’s “Boomer and Carton” show, claiming the severe discipline Peterson meted out to his son was similar to what he experienced as a child. Is Reggie Bush just needing some attention? If so, here it is, sir. You got it. Rihanna isn’t very happy with CBS. See, Rihanna did a rendition of “Run This Town” for the game on Thursday, but given the controversy surrounding domestic violence, CBS decided to pull it. SMH. When people figured out that this week’s Thursday night football game between the Baltimore Ravens and the Pittsburgh Steelers would open with a song from Rihanna, they weren’t pleased, and the NFL gave in to them by agreeing not to play the song. But the reaction says more about how we unfairly treat victims of domestic abuse than it does about the NFL’s sensitivity to violence against women. CBS Sports and NFL Network plan to open every Thursday night game this season with “Run This Town,” the 2009 collaboration between Jay Z and Rihanna. But, after an especiallycontentious week of controversy over former Ravens running back Ray Rice — who was dropped from the team after a surveillance video depicting him punching his then-fiancee was made public — it seemed like a bad PR move to include Rihanna, who was infamously the victim of domestic abuse in a former relationship with Chris Brown. After considerable push back for partnering a Ravens game with a Rihanna song, the NFL Network decided to reconsider. “Run This Town” did not play on Thursday night; instead, CBSaired coverage of the domestic violence controversy surrounding Rice. “We thought… we needed to have the appropriate tone and coverage,” a spokesperson for the NFL Networksaid. Not including a song by Rihanna, because she was a VICTIM of domestic abuse? “As evidenced by our decision to deactivate Adrian from yesterday’s game, this is clearly a very important issue,” the owners said. “On Friday, we felt it was in the best interests of the organization to step back, evaluate the situation, and not rush to judgment given the seriousness of this matter. At that time, we made the decision that we felt was best for the Vikings and all parties involved. The police report says the doctor described some of the marks as open wounds and termed it “child abuse.” Another examiner agreed, calling the cuts “extensive. When Peterson was asked how he felt about the incident, he said, “To be honest with you, I feel very confident with my actions because I know my intent.” He also described the incident as a “normal whooping” in regards to the “welps” on the child’s buttocks, but that he felt bad immediately when he saw the injuries on the child’s legs. Peterson estimated he “swatted” his son “10 to 15” times, but he’s not sure because he doesn’t “ever count how many pops I give my kids. I was spanked as a child. I’m all for it as a form of discipline. However, I recognize that parenting and discipline has evolved, and there are other techniques that can (and should) be used. I am of the opinion that more parents should seek to learn these methods, and gain understanding of the reasoning behind problematic behavior in children. Spanking shouldn’t be the only form of discipline parents enforce. But this is the thing. The other forms of discipline take PATIENCE. They do. And it can get frustrating. And that is why spanking ends up being the go-to form of discipline. It’s quick. It’s fast. Immediate. But the truth is that it’s not appropriate for every single discipline problem. But yeah. Sometimes you just gotta get that belt out. That’s just my opinion. Personally, it looks like things went way too far. Leaves in the child’s mouth? For what? damage to his SCROTUM? A “whooping room? ?” Nope. Never. No. Unacceptable. After seeing the pictures, I can understand why the doctor called authorities. He/she basically had no choice. In that profession, if there is ANY evidence of abuse, they HAVE to report it. I’m assuming that they are going to go with the whole “innocent until proven guilty” thing. You know, how we do things here in the United States of America (supposedly?). I understand the argument that they could suspend/bench him until it’s all taken care of, but is that really the best course of action? Or should they do exactly what they are doing, waiting for the investigation to play out, let the legal system work, and then enforce whatever punishment for violating whatever policy that they have in the contract? As of now he isn’t guilty of anything. Let’s not forget that. I understand both sides. And the truth of the matter is that no matter what decision the NFL makes, they are in so much deep s*** right now until it almost doesn’t even matter what they do. They aren’t going to be looked at favorably either way it goes.